The Old Station Tea Rooms on Okehampton Station offer a delicious selection ranging from cooked meals to snacks, cakes and hot drinks. Meldon Buffet opening times can't be guaranteed at the moment, and we would advise potential customers to check with the enquiry number below before visiting, especially after train services end at the end of September. 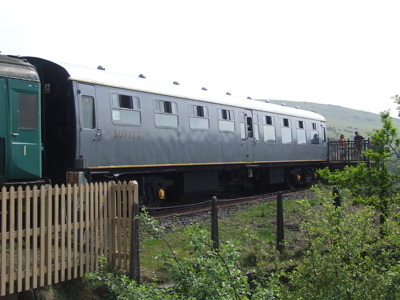 The buffet is in a former buffet coach, and enjoys tremendous views of Meldon Viaduct, Meldon Dam and the West Okement valley. More details of the coach are in our stocklist. For enquiries about either of the above, tel 01837 55164.